While most women are aiming to reduce most of those numbers, there is a percentage of women who are trying to increase some of them. We’ll talk about that in a future blog post. For now we’ll focus on the problems faced by the majority. Too much weight, dangerous body-fat levels and measurements that signal high-risk health profiles. Enhanced moods, self-confidence, happiness, zest for life and a host of other improvements come via the ‘cascade effect’ of proper habits of fitness. See, we help women do ALL THE THINGS they have not been able to do on their own. And it’s not like you don’t know. YOU ARE intelligent. Deep down, you know you’re not taking proper care of yourself. Some call it blind ignorance (where you don’t realize you’re being ignorant about your personal well-being). For a number of years I’ve felt as though I had completely lost control of my body. As I thought about those things, those investments, I realized that they were a very important part of who I am and that the time and energy invested in them was important and worthwhile. Then my thoughts turned to the things I wanted to do and enjoy, for ME, but I was tired and feeling old. At that moment I realized I wasn’t invested in the most wonderful gift of life that I had been given. Someday, would I be able to say that I had used that gift well and truly made the most of it? That’s the moment I decided it was time to make a change. Maybe that’s because my focus was more about “losing weight” as opposed to an overall desire to feel better and to be healthy and fit. I knew I needed a shift in mindset but I wasn’t sure how to make that happen. Just when I needed it most, I met Joey. He came to our church for a wellness event we were hosting. I stopped by his table and signed up for a sample session at the SCULPTAFIT Studio. And it wasn’t a hard decision since I already knew it was time to do something and this seemed worth a try. I went to the session and enjoyed it. I was tired and much of it was challenging, but very doable, and it actually felt good. The next day I was pleasantly sore in places I didn’t know I could be! I realized just how dormant I allowed my physical body to get and how deconditioned I had become. The weekend went by and on Monday, I was ready to go again. It did even better the second time and I decided to sign up right there and then. I knew this was going to be the thing that “works”. This was a conscious investment in my health and I was approaching it from that standpoint. Sure I want to lose weight but this time it needed to be much more than that. After my first week, I felt good about my effort and after the second week I actually felt energized! LOTS of positive things were starting to happen. Fast forward 4 months. My continued “investment” is already paying big dividends. I enjoyed the holidays, stayed on target and have no regrets. This is the first holiday season where I actually got into better shape, despite all the parties, food and desserts. Amazing. I began incorporating D.I.B.S activities (Days In Between Sessions) into my schedule around the second month and I’ve been able to do more and more each month. I feel great! I’m stronger, happier, and my body is responding positively. …and I wake up rested and ready to face the day, looking forward to each one of them now. Still, I can’t deny that I am a bit of a numbers person and I do get some motivation from knowing that in 18 weeks I’ve lost 36 lbs, approximately 4% body fat and numerous inches off my waist and hips. I’m looking forward to life, to traveling, to spending time with my family and creating lasting memories. I’m advancing toward my fitness goals and my muscles and joints are getting stronger. More than anything else, I’m creating a knew lifelong habit of living a healthy, active lifestyle. While I’m still a “work in progress” I can say I’m in control again and I’m loving every minute of it! There’s one last investment to mention. The coaches at SCULPTAFIT have made me feel as if they are also invested in me. Their words of motivation, support, reassurance and encouragement to be better have made all the difference. They help me stay focused on my health, keep me accountable and celebrate in my successes. I’m grateful to have them on this journey to My Best Year EVER! 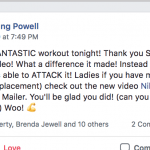 BUT if you do join the movement here, and want to share YOUR success story of your journey, so that YOU many inspire other women to do the same, then we would love that of course! Low-Intensity Interval Training is a key element that Joey has been pioneering for at least a decade and it is part of the foundation of The SCULPTAFIT Method, and as a Team we are now perfecting this approach week after week, month after month… And the results are showing. 3 – Thanksgiving comes and because of your multi-family situation (or maybe you have lots of close friends) you end up doing 2 or 3 Thanksgiving meals over the course of a few weeks… And of course we have the leftovers that can’t go to waste, right? But we know where this all ends right? You’ve been operating in a matrix. A matrix that keeps you on the same cycle of repetitive failure. But now you’re going to “wake up” and rise out of that dysfunctional matrix. Because it’s the ONLY WAY you’re going to achieve your true goals. You need to be honest with yourself. Look yourself in the mirror and tell yourself the clear truth. Have you been putting yourself first and taking proper care of yourself? Have you been tending to your body, mind and spirit? The answer is most likely “No, I haven’t.” and that’s understandable, because modern day society makes it VERY hard for us to focus on ourselves the way we should be. Your life is yours to manage and yours to spend how you see fit. BUT, you have to rise out of the chaotic mix that everyone operates in and start making your weekly plans THAT PUT YOU FIRST and allow you to take care of yourself the WAY YOU’RE SUPPOSED TO. It’s really that simple. Once you decide, then the rest is easy. You make your plan and the world will shape itself around YOU. 1 – SCULPTAFIT Personal Training: this is exclusive and private, but some women have asked for it and it is now an option here. 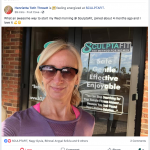 And we totally understand, because almost all of our new clients here at the SCULPTAFIT Studio, have been on and off the diet roller-coaster… Always ending up where they started, or even worse – a few pounds heavier. 1 – “Dieting” does not work. It’s inherently dysfunctional. 2 – It sets you up for internal conflict, and struggle, right from Day #1…. 3 – Once the self-deprivation starts, you begin craving all the things you’re not supposed to be eating. You start getting edgy and moody, and it only gets worse from there. 5 – And it sets you up for another frustrating setback that leaves you even heavier than before you started the “diet”. And once you start messing with the hormonal system – further destruction and damage are just around the corner. You may even have a friend or two who suffered this fate. Most “dieters” are missing a few critical elements in their quest. Hence the repetition of the “roller coaster ups and downs” of yo-yo dieting. Truth is, the dieting industry THRIVES on the roller-coaster nature of human behavior. People want quick fixes, and will keep buying and trying them “THINKING” that eventually something “might” work… (NOT going to happen). Hence the multitude of “new” diet books and weight loss products that hit the market EVERY YEAR. This image represents just a sliver of the current mass of diet books on the market. Crazy, really. Yes, there are some great “diet” books that are really just wise nutritional meal plans, compiled into a book and given a cool name or title. HOWEVER… most women, even if fortunate enough to stumble across one of these good ones, still lacks a critical element needed to make the jump from “serial dieter” to “women who is living a healthy lifestyle”. You are not trying to lose weight to improve your health, but rather; you take steps to improve your health and wellness and the weight-loss happens as a natural by-product. <<= Read that one more time. The “weight-loss” happens naturally because of your bigger picture “life vision”, which is all tied to your MINDSET. Weight-Loss Without Being on a “Diet”? C – subtle changes in your choices and habits, so they are in line with your goals and values. Those are the 3 Critical Keys to Fitness Enhancement and Weight Reduction that we guide women through, here in the SCULPTAFIT Studio. Weight-Loss comes as a pleasant “side-effect” of healthy habits of female-focused fitness and sensible, well-rounded nutrition. Do YOU Want to Get OFF the Yo-Yo Diet Roller-Coaster? Together we reduce all the negative forces and influences on your life – and we replace them with empowering and nurturing forces that lift you higher and higher, by making you stronger and more energetic… Physically, mentally and spiritually. You Become a Vibrant Force of Nature (As Intended) and No Longer a Withering Shadow of Years Past. Get off the diet “roller-coaster” ASAP… and come meet us to see where your “answer” is waiting for you. YOU owe it to YOURSELF and you deserve it. Your life is a DIVINE gift and it’s up to YOU to take the BEST care of it. IMPORTANT Weight-Loss QUESTION: Which of these have you attempted? A – Fad-Diets: You’ve tried a few of these over the years. And what happened? You do it for a while, ‘maybe’ lost weight. But then you stop for whatever reason. And ALL the weight comes back, sometimes even MORE weight comes back… (And slowly keeps piling on as the years tick by). B – Quick-Fixes and “Procedures”: These range from “toxin cleanses” to H.C.G. shots to appetite suppressants to “alternative treatments” (aka – SCAMS), and you know a few of the others as well… AND, we all know how those turned out right? NOT TOO GOOD. It’s frustrating, no doubt…. (and you’re not alone with this issue). 1 – You CANNOT remain “sedentary” and expect to lose weight. There is NO MAGIC PILL that that can “slim down” a sedentary, sluggish & bogged down body. Get this; you have 640 muscles in your body, and if you don’t activate them regularly, you get flabby, fat and sickly. So simple. That is a law of nature…. When you look in the mirror naked – you see the superficial symptoms of a body (and life) that is decaying and aging rapidly, right before your eyes. 2 – You must eat in a way that SUPPORTS YOUR LIFE (I’m not talking about dieting… Fad-DIETS are A SICK JOKE). WE need high quality, nutrient dense foods and meals in order to SLOW the aging process, protect us against decay and disease, and let us live with strength, vigor, vitality and HIGH quality of life – regardless of our age. You CANNOT eat garbage and expect to be in good health… wake up!! it just doesn’t work that way. If you’re seeking happiness in food – it’s NOT there. (we help women reverse these dysfunctions). 3 – You must respect, honor and protect your body – the GIFT it is… with APPROPRIATE and Gentle exercise. By stimulating it with PROPER gentle exercise – you *reverse muscle atrophy and you re-activate dormant muscles*, which NEED fuel – and that fuel comes from those excess fat deposits being stored all over your body. Those metabolically active muscles start eating away at that excess body-fat like termites eating wood. YOU MUST KNOW the proper type of exercise program that is APPROPRIATE for a woman. I’m not talking about a “gym program” with painful weights and awkward machines… Not talking about a wild dance class, or a brutal boot-camp…. And on that note, I must let you know that I have 2 FREE Sample Session “Women’s Weight-Loss Packages” to give away right now, (someone else just grabbed one before you) and I’d like YOU to have one of these last 2. This 1 free fitness & fat-loss session gives you a chance to see what a “Proper Female Fitness” program is supposed to look and FEEL like. **PLEASE include your best phone number, to have the best shot at getting one these free session packages. At minimum, you’ll finish your Sample Session KNOWING EXACTLY what you should be doing to slim down, be in shape and get healthy again.